Face masks are a great way to feed your skin healthy antioxidants. After a long day, nothing is better than kicking up my feet and pampering myself with a summer fresh face mask. In a bowl, mash the strawberries with a fork until smooth. Add the honey and yogurt (for oily complexions) or cream (for dry skin) and mix until the ingredients are well-incorporated. Using clean hands, gently apply the mixture all over your face, avoiding the eye area. Sit back and relax with the mask on for 10 to 15 minutes. Wash it away with warm water, pat your face dry and follow up with your favorite toner and moisturizer. Facial Scrub. If you prefer a scrub instead of a mask, you can mash together about a dozen strawberries with 1 teaspoon of pure cane sugar and 1 teaspoon of olive oil. Scrub gently in a circular motion around your face and neck as a natural exfoliant. When done, simply rinse off and pat dry. Your skin will look fresh and glowing. Reduce puffy eyes. Slice down strawberries and keep two of the slices on your eyes and relax for 10 minutes. The same can be done with cucumbers. Soothing Foot Scrub. Slough away rough skin on your feet by mashing together 8 strawberries, 2 tablespoons olive oil, and 1 teaspoon of kosher salt. De-tan your skin. Strawberries help in lightening pigmentation marks also. For both these purposes just mix lemon juice and strawberries, mash together, and apply for 15 minutes, then wash it off. Gently massage this “paste” to your feet, allow to sit for a few minutes, then wash off and dry. Get that natural glow. 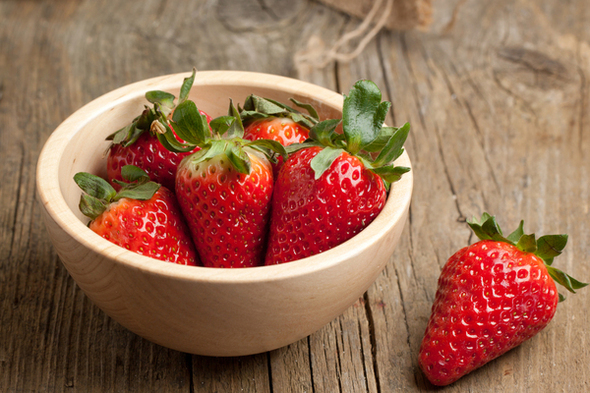 Mash together strawberries with cocoa powder and honey to get a bit of a summer glow to your skin. Simply apply to skin for 15 minutes and then wash it off. This entry was posted in Beauty Photography, Boudoir, Uncategorized and tagged boudoir photo, Cicero boudoir, face mask, facial mask, photo session, strawberry mask, summer beauty, Syracuse boudoir. Bookmark the permalink.